Brontë’s treasure hunt runs into a snag. Now in retrospect, I probably should have immediately rescued her instead of grabbing my smart phone to take a photo, but I really wanted to capture this moment for posterity. It’s just so… so very hilarious. It’s not often that curiosity combined with shaky physical coordination leads us to end up stuck face-down in a trash can. 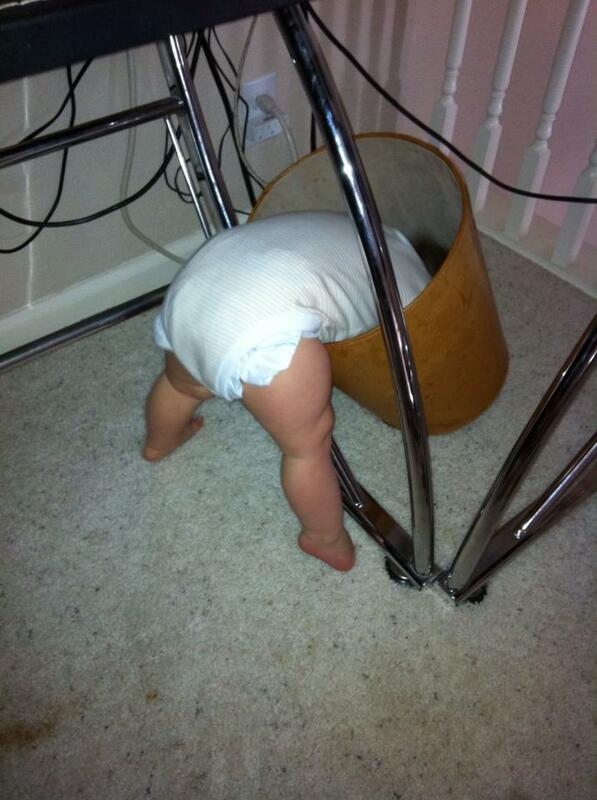 Babies, however, haven’t yet learned proper risk-assessment in these situations. All Brontë saw was a mysterious new container that in her world might have chocolate bars or unicorns in it. I can’t imagine her disappointment upon figuring out that not only was there absolutely nothing in this new container, but also that she was now bent in half and unable to move. Note the fact that she is on her tippy-toes in this position. This is one of the myriad of reasons that children need parents. At least the trade-off for the parents is quite a bit of entertainment. Just when you think you have it covered, the baby will develop new abilities, like crawling then walking, then using objects as step-stools to reach ever higher counters. One day, Brontë managed to push a chair from the kitchen table over to the counter, crawl up on the counter, open a cabinet, and start dropping dishes on the floor until she had created a giant circle of broken glass around the chair. I’m just glad I managed to grab her before she tried to climb down! Babies will get into mischief you can’t even dream up.